Anyone know what this bird is? I saw it near the bottom of the Saline Valley. Almost looks like a scruffy peregrine falcon, but coloring on breast is wrong. It's a tough call with this image, but I'm going to go with Red-tailed Hawk, based on overall coloring patterns. 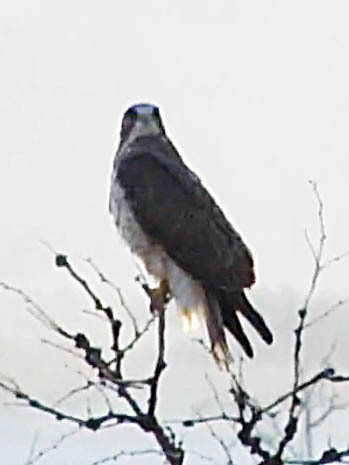 Hard to tell with the back light but much more likely peregrine than red tail (look at the white facial markings). Processing the following frame out of the video clip, it does look like it could be a peregrine. Everything I've looked into says this is a peregrine, so that is what I'm going with. Thanks, guys!